Nigeria's fast emerging charity foundation and Non- Governmental Organisation. 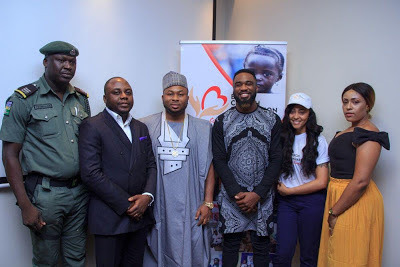 Big Church Foundation yesterday, 21st February unveiled popular music artist Praiz Adejo as one of its Ambassadors for the 2017 project year. The signing and papers works was done at the Ikoyi office of the foundation's boardroom. project which is targeting the Nigerian youths. He further buttressed on the choice of Praiz as worthy one, who has also worked with the Big Church Foundation during charity campaigns in the past. " We congratulate you and we know with your presence we can achieve a lot in the area of charity empowerment and project executions nationally and internationally"
Big Church Foundation which has offered university scholarship, made donations to the less privileged, Visited crisis ravaged areas, supported hospital patients, partnered with charity events and hosted empowerment campaigns unveiled Praiz to pilot the empowerment of 36,000 youths in Nigeria through the 36 states. 1,000 youths from each state are to be empowered through talent hunts, skill acquisition, loans, small business starts and job creation. Mr. Raphael Cudjoe - Head of IT, Clay - Multi-Media Department, Maureen Cyril of GoodGirl Foundation, Ivy Cypriel of Crown & Glamour TV ‎and others.